WHAT makes a number one Elvis Presley fan? If you have a room dedicated to a few hundred pieces of Elvis memorabilia, own the original recipe of Elvis' favourite cake and have rubbed shoulders with Priscilla and Lisa Marie Presley, then you're on your way to owning the top position. Susan Kynaston has been a fan of the King since she saw him in on the big screen. "I was about eight years old when my Dad took me to see Kissin' Cousins. He played two characters and so it was double Elvis," Mrs Kynaston said. "I saw him on the screen and just to watch and hear him sing, I was totally mesmerised. She next saw the King perform in concert on April 30, 1977, which she described as an "electrifying" performance that she would never forget. "I paid $12.50 for a ticket, would you believe. I still have the ticket, it's very faded but I've still got it," she said. 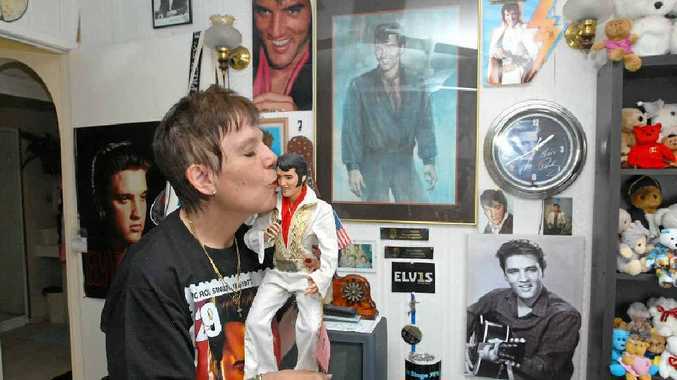 The ticket joins the few hundred items in her room dedicated to Elvis' life. "I have cups, statues, photos, jackets, pins, dolls," she said. "I'm probably right up there (as his number one fan), very much so," she said. Most of us know him for his music, movies and the man who will be forever known as the King, but Susan knows him for his behind the scenes humanitarian work. She told the story of how he regularly donated funds to support cancer research and to a widow who lost her husband while he was performing in the line of duty. "That's the kind of man he was and that's what endeared him to me. He was a great singer, very handsome, but it because of his humanitarian work," she said. Canadian born and bred, Mrs Kynaston moved to Mackay 10 years ago and was sure to bring her passion with her. She is the group leader of the official Southern Cross Silver Stars Elvis Fan Club, which has been running in Mackay for nine years. The group of about 14 members puts their passion for Elvis and helping people together and held their annual Girls Night In fundraising event on Saturday night. The girls-only Elvis-filled event raised $140, which will be donated to the Cancer Council.